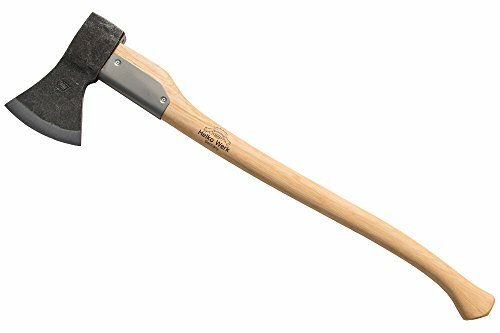 The Bavarian Woodworker is a cutting axe with a traditional German wide-bit blade to be used for heavy cutting and felling tasks. This sharp, slim, wide-bit woodworker head will outperform most American patterned felling axes at cutting tasks, and is quite capable for splitting work as well. The steel overstrike protector reduces shaft wear and breakage, and protects the handle against miss swings. Each piece is hand crafted by Helko's Master Smiths, lifelong artisans of metalcraft. The Smith uses tongs on an open face drop forge to shape the head, a skill requiring impressive control and hand eye coordination that can only be achieved through years of practice. Once satisfied with his work, the Smith hammers the Helko Werk crown logo into the cheek. Only minimal supplementary work is performed, allowing each blade to proudly display its forging marks. No two pieces are exactly alike. If you have any questions about this product by Helko Werk, contact us by completing and submitting the form below. If you are looking for a specif part number, please include it with your message.